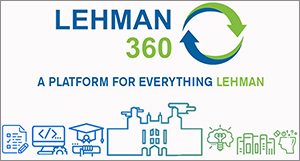 We are pleased to announce the launch of Lehman 360, an online platform that places students at the heart of the school’s digital ecosystem—while giving students, faculty, and administrators the important information they need to work faster, smoother, and more efficiently. To access Lehman 360 from your phone, download the Lehman College mobile app from the App Store or on Google Play. To access Lehman 360 from a desktop, go to Lehman.edu and find Lehman 360 under “Login” at the top of the page. To log in, use your Lehman account, which is the same firstname.lastname and password used for wireless access. In recognition of their innovative work, the faculty and staff who made Lehman 360 a reality, recently won CUNY’s IT Collaboration Award at this year’s CUNY IT Conference. The new digital platform will keep students, faculty, and staff up-to-date with the personalized information they need—such as GPA, academic standing, course schedule, and financial aid, etc. — in one, user-friendly place. Lehman 360 delivers data from multiple systems into a single location and is conveniently accessible on mobile devices or from the Lehman home page. “Lehman 360 provides information tailored to every single student,” said Deira Pereyra, Lehman’s director of IT application services, who has been helping to develop the platform since last May. “It’s a collection of tools delivering data to students and has a social media look and feel,” she said. It will also help students manage their academic careers. For example, students who have nearly 60 credits, but who have yet to select a major, will receive an notification or “nudge” with a link to the school’s iDeclare page—an electronic tool that allows students to declare or change majors. Another component of Lehman 360 for faculty and advisors will allow them to message an entire class and access class wait lists.